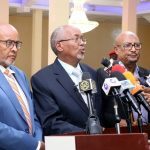 A delegation led by the speaker of Somaliland parliament Hon.Bashe Mohammed Farah and the minister of internal security Mr.Mohammed Kahin Ahmed toured the southern part of Sool province whereby two brotherly clans fought. The visit was a public awareness campaign on the importance of security and peace in development. This is according to information reaching Somaliland News Agency (Solnanews.com) from their Lasanod reporter Mr.Barkhad Omar Ahmed. The peace convoy passed through Dhumay, Dharkeyn-geeyo,Daba-taag, Saah-dheer and Kalabaydh all located in South of Sool province. 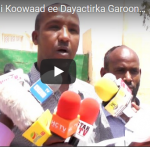 The minister of internal security Mr.Mohammed Kahin Ahmed confirmed that the two clans have accepted the proposition of a cease fire and have embraced peace. Speaker of the house of representatives stated that the peace talks is going in the right direction and the two brotherly clan want to bury the hatchet and open a new leaf to their coexistence.